Because I became violently ill on our last visit to the Bugaboo Creek in Seekonk, MA, Mom and I had decided that maybe this steak house wasn't for us. We avoided it like the plague, and even gave it the finger a few times when we drove by. When I say that I got sick, I mean sick. So sick that I wrote a complaint letter to the corporate office. Their idea of compensation? A $50 gift card so that I could return and possibly have the same thing happen twice. Not wanting to let the card go to waste, I invited two friends who I wasn't that crazy about and let them pig out while I stuck with something simple. Luckily, nothing happened to me. Since all this happened many years ago, and I was in an adventurous mood, Mom and I decided to visit this Bugaboo location again. With a steady rain pouring down on us, I dropped Mom off at the front door and pulled into a parking spot at just about 3:10 p.m. The parking lot wasn't full, but when we got inside, we were told by the hostess that we would have to wait for a table. Wait? Anyone who knows me knows that I hate waiting to be seated. That's why Mom and I never go out to dinner during peak hours. "What are we waiting for," I said out loud, trying to get the attention of the hostess. "There's no one in here." Mom and I reluctantly took our seats on the beautiful wooden benches in Bugaboo's waiting area. We noticed that there were several people leaving, but no one had come over to bring us to a table yet. "What is going on," I said impatiently. Finally, a waitress came over and asked us if we would like a booth or a table. When Mom said table, the waitress said that she would clean one off for us, and that our wait would only be a few minutes longer. C'MON!!!!!!! Move it, already! After waiting for what seemed like forever (it was probably only 10 minutes), Mom and I were finally shown to a table - and guess what - there was NO ONE there. There were literally only a handful of people sitting in the booths and tables in the main dining area. Seeing the lack of customers only made me more mad because it seemed that we had been stuck waiting for absolutely nothing. After we were seated and left with two colorful, plastic menus, we were greeted by John, our waiter. After rattling off the new lobster specials, he asked us what we would like to drink. We told him two Diet Pepsis. They quickly arrived in two glass mugs, but the soda was extremely watered down. Mom's cola was almost clear, and we both commented on how Bugaboo may be cutting costs. John also brought us a loaf of wheat bread with a cup of butter on a wooden cutting board. We cut into it right away, and it was very warm and tasty. We asked John for a few minutes because we were undecided as to what were going to get. When we finally narrowed it down, John returned to take our order. Mom chose the patty melt minus the grilled onions ($8.79), and I chose - at the last minute - the tilapia tacos ($7.99). After John retreated to the kitchen, I checked the time. Mom and I were on our way to see Journey to the Center of the Earth - in 3D! It started at 4:30 p.m., and since we had been left waiting earlier (for no reason), we were now playing beat the clock. I believe John may have overheard me say, "We only have an hour," because it was soon after that he came over to our table, apologized for the wait, and told us that they were very short-staffed. Apparently Bugaboo had been very slow the past few Saturdays, so the waitstaff had been shortened. Unfortunately, business had picked up today and the team was trying to keep everything under control. I was just really hoping that this little mess wouldn't cause us to miss our movie. Mom and I decided to take our minds off the clock and take a look around at Bugaboo's adorable interior. Bugaboo Creek is made up to look like a lodge. 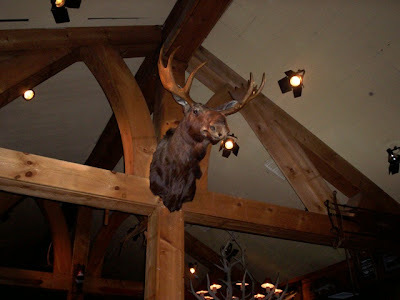 There is a large stone fireplace, beautiful wooden rafters, red and white checkered table cloths, stuffed animal heads on the walls, sleds, hunting equipment, jugs, fish, old photos, and various other outdoor-inspired decorations. I even commented on how I'd like to wear the snow shoes on the wall because they look like giant flip flops (my favorite). The main attraction for the kids is that some of the animal heads and fish move and flap. Unfortunately, nothing was moving or flapping today because we overheard a waitress tell another family - with two young children - that the animals had been electrocuted during the recent storm. Good thing they were already dead! Hope the kids weren't traumatized. 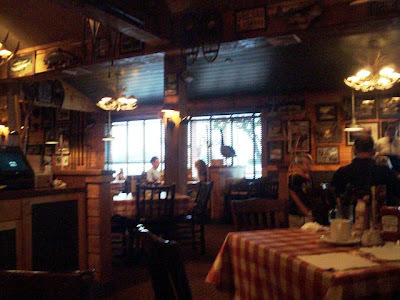 Bugaboo Creek really offers a lot of different things, but it is billed as a steak house. With several premium, USDA grain-fed Midwestern beef options such as the prime rib, Fireside sirloin skillet tips, lodge filet, Timber Creek t-bone steak, Bourbon flat iron steak, Portabella bleu cheese filet, black magic steak, Charlie Morgan ribeye, and the 12 oz. Mountain Man strip, meat lovers will be in heaven here. Also on the menu are smoked baby back ribs, home style BBQ meatloaf, grilled pork chops, burgers, chicken and fish dishes, soups, salads, and a long list of appetizers, specialty drinks and desserts. For those with gluten-restrictions, Bugaboo offers a menu just for you. 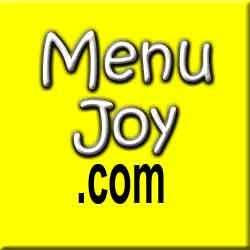 The prices here are pretty average for a chain restaurant, and the portions are quite large. They even offer several kids' meals, all which come with an ice cream treat for dessert. I'm jealous! The only problem we have with the food is that Bugaboo seems to par-boil the chicken before they grill it, making it very soft and limp. Doesn't sound too appetizing, does it? Also, it's a toss up as to what I got sick on the last time - the smashed potato cake appetizer, or the chicken cubano sandwich. I saw neither on the menu this time around. Before long, our food had arrived. Both dishes looked very tasty. 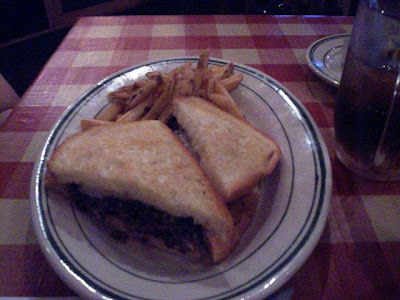 Mom's patty melt - which was topped with Swiss cheese and horseradish sauce - was cooked medium well, which is exactly what she asked for. Accompanied by some fries, Mom said that the patty was tasty, the buttered panini bread was not greasy, and the Swiss was not overwhelming. Surprisingly, she found the horseradish sauce - which she was a bit nervous about - to be quite tangy and delicious. Mom also enjoyed the side of fries, which she said were hot and good. My tilapia tacos were a last minute decision which I did not regret. 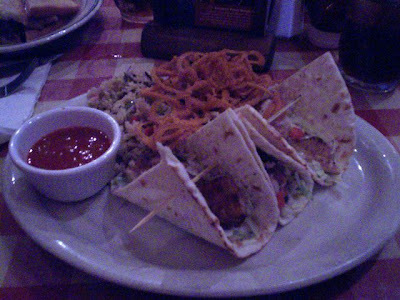 Served on flatbread with a large wooden skewer through the three of them, the Cajun-roasted tilapia was very tasty. Each taco was stuffed with a mixture of shredded cabbage and cilantro ranch dressing, to which I added the accompanying tomato salsa. The flavors came together very well, giving the taco a fresh, clean taste. Also on the plate was a serving of fried onion strings and wild rice medley. Since I'm not a fan of rice, I only had a couple of forkfuls. It was good, but really not my thing. I did find the onion strings to be a little on the greasy side, but this is normal with this type of fried food. Notice anything? John left off our sodas. I don't know if this was a mistake, or if this was something he did because he knew that we had been left waiting, but either way, I didn't have time to correct the error (sorry, John). We had a movie to catch! I left $21 on the table for John which included a 20% tip. Before leaving, Mom and I paid a quick visit to the ladies' room, which was most improved from our last visit. It was neat and clean, versus the gas station outhouse that we were subjected to the last time (which I also discussed in my now infamous letter). Thankfully, Mom and I made it to the theater just in time to pick up our 3D glasses and watch the movie - which was a lot of fun. After the movie, we were talking about our meal at Bugaboo, and about our previous visits. We agreed that today's meal was good, but that - in general - Bugaboo could do a lot better. The service is not always that great, and sometimes the food isn't very inspired. We've bumped it up from two hearts to three only because a) I didn't become ill, and b) the food was tasty. However, we do feel that this adorable chain hasn't really lived up to its full potential. 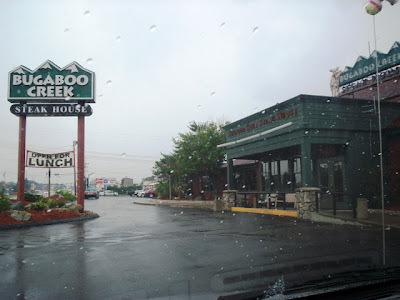 The Bugaboo Creek Steak House in Seekonk is located at 1125 Fall River Avenue. For more information, visit their Web site or call (508) 336-2200.